The news from Google I/O just keeps rolling in, and this time Google unveiled a major new unified messaging service for iOS and Android called Hangouts. Originally called ‘Babel’, Hangouts is a cross-platform service that will replace Google Talk, Google+ Messenger and the Google+ video chat. Similar to WhatsApp or iMessage, Google Hangouts is a synchronised chat service that will work across every device you can think of – computer, iPad, iPhone, and Android. The Google Hangouts messaging service will allow the sharing of photos, emoji, and video calls, together with traditional text conversations. Google also allows users to go back through the chat history, delete messages, and even retrieve files from previous conversations. The conversations are all stored in the cloud for seamless syncing across multiple devices. “Presence, or knowing when friends are available to chat, is a big focus. You can see when friends are on Hangouts, if they’re currently typing, and if they’ve seen your messages [also known as read receipts]. Using Google+ Circles, you can select specific friends or a whole group to start a chat with. The Hangouts service is platform aware, so there’ll be no chance of getting duplicate notifications – something that iMessage struggles with when using multiple devices., Google need to get this right since not only are they syncing multiple devices, but are syncing multiple platforms. The new Hangouts service is extremely exciting and will hopefully mark the beginning of a whole trend of cross-platform services that bridge the gap between consumers of Android and iOS. 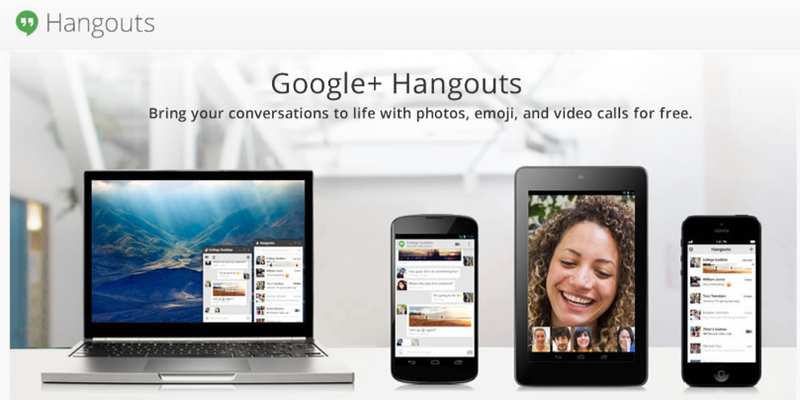 Hangouts is available now in the App Store here.